We are all used to interfacing with a computer through mouse, keyboard, and in more recent times, touchscreen. 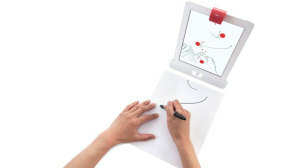 Osmo has created an educational game system that allows you to interface with the iPad through physical objects. It’s a new way of using the iPad to engage children in learning and it is as close to a magical experience as I have come using an iPad. Firstly, the Osmo package comes with a stand, a mirror clip for the camera, a set of blocks and a set of letters. Setup is extremely simple indeed and you are directed to download the three Osmo apps which go with the device; Tangram, Newton and Words. All you need to do is put the iPad in the stand (making sure you have used the correct attachment for your type of iPad), clip the mirror on to the front iPad camera and fire up your chosen game. The mirror points to a space in front of the iPad, as if it was sitting on a table in front of you and the software uses the camera to detect what is in front of it. It’s a similar idea to Kinect, although clearly the iPad camera is not quite as advanced as this. I set Osmo up in my kitchen, which to be fair isn’t the brightest room in the house and with my 5 year old daughter as guinea pig, tested out the different apps. I must say that she had done a full day at school, including after school care and is normally pretty tired, but it is fair to say that playing Osmo certainly perked her up a bit, even though the games required quite a bit of thought on her part. We started with ‘Words’ in 1 player mode. The Words app brings up a very nice HD picture of an object and asks the player either to put the starting letter of the word in front of the iPad, or complete the whole word with the physical letters provided. The letter recognition was great and picked up the letters almost instantaneously as my daughter picked them out, with a satisfying ‘ping’ if she got it right. There is another mode as well where you can race an opposing player with the two sets of letters provided to spell out the word correctly. We then moved on to Tangram which my daughter loved. Tangram is a really good educational concept as it is normally a good marker for good levels of mathematical skill. It involves the Tangram app displaying a picture made of different coloured shapes. The player then has to copy the the picture using the wooden blocks provided before moving onto the next one. Again, the recognition of each block was extremely impressive. It even picked up if a block was the wrong way up, prompting the player to ‘flip’ the block if they were struggling to make the shape. The final game included is ‘Newton’. We struggled with this a bit as my daughter couldn’t quite make the connection between what was being displayed on the screen was actually what she was drawing and the fact that it was all part of a game. The idea of this is balls drop from the top of the screen, you have to draw lines or shapes on a bit of paper in front of Osmo to ‘direct’ the balls to a target zone. It’s a really cleaver concept on the iPad, but it does burn through paper like there is no tomorrow. I would recommend getting a wipe on, wipe off board and pen for this. You could even use your hand to direct the balls, which is probably a little more environmentally sound, and work on those fine motor skills. Osmo certainly brings something new to the iPad table and they have stuck to the iPad tradition of making a product with the “it just works” mantra. There is no messing about with the set up, you can literally be up and running in seconds. 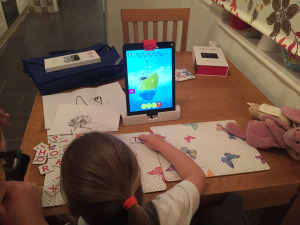 I think Osmo is definitely worth a go if you have an iPad and children under the age of 11 in your house. It gives them something tangible and educational to play with (which of course is always gratifying for us parents), but it is also compelling and interesting for them. I’m quite keen to see how Osmo take this concept further as there is definitely scope for adding to the games collections. I could see some sort of game involving packs of cards and adding and matching being quite an interesting concept for example. I always like iPad developers trying something a bit different and also having a very polished product. Osmo does both of these things and also gives you back that ‘wow’ factor that the iPad over the years has made us accustomed to. Disclosure: Osmo sent me a review unit. I use Osmo in my classroom of 2nd graders. For Newton we use items such as pipe cleaners and craft sticks to direct the balls.